Currently, both contact-handled (CH-TRU) and remote-handled (RH-TRU) transuranic waste are allowed to be received and buried at WIPP. Specific procedures are followed when the waste arrives at the facility from the time it comes through the gates until it is stacked in the disposal room. Before it arrives, it has already been through characterization at its generator site (see the section on The Waste/Waste Characterization for more information on characterization). It is then loaded into the transportation container which is transported by truck to WIPP. Information about each shipment is carried in several databases including an electronic database and in shipping papers that accompany each load. Upon arrival at WIPP the tractor trailer and shipping container undergo 'surface processing' which includes a security inspection, a radiological survey, and a shipping documentation review. Radiological surveys include checks with a dose rate meter and surface swipes taken at specific points on the outside of the container. Once the shipment checks are completed, the tractor-trailer is parked near the Waste Handling Building (WHB) for additional inspection and radiological survey. A 13-ton forklift is then used to transfer each container from the trailer, through an air lock, and into the Waste Handling Bilding. Inside the Waste Handling Building, the container is placed in a TRUDOCK, which holds the shipping container in place while workers unload the waste. An overhead crane is used to remove the lids. First the outer lid is removed. (The picture at right shows the outer lid of a TRUPACT-II container being removed with the inner lid visible underneath.) Then workers put the vent hood cover around the inner lid and hook up an exhaust system which vacuums the air and any contamination which might be inside through HEPA filters. More radiological surveys are conducted and the crane is used again to remove the inner lid. 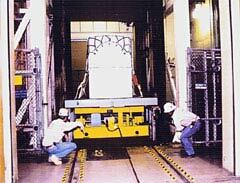 An underground transporter (similar to a lightweight flatbed truck) pulls the loaded facility pallet off the hoist and onto the bed of the transporter. It then moves the waste to a disposal room where a forklift removes the waste containers from the facility pallet and stacks the waste in the room. 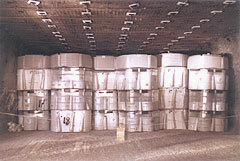 Bags of magnesium oxide (MgO) are placed on top of the containers to serve as backfill. 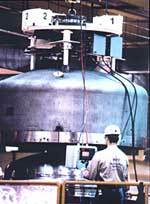 The magnesium oxide is the only engineered barrier at WIPP and, among other things, attempts to control the solubility of the radionuclides in the waste. Waste in 55 gallon drums is stacked three layers high and six columns wide in the disposal rooms. Because the ceilings, floors and walls are closing into the rooms, there may come a time when DOE will be able to stack the drums only two layers high. If so, and If the distance to the ceiling is greater than in the original performance assessment calculations, the effects of a roof-fall on the waste containers could be greater than expected, possibly causing contamination problems in the rest of the facility. Each panel in the underground is made up of 7 disposal rooms. Since RH-TRU waste is buried in the walls of the disposal rooms before the CH-TRU waste is stacked on the floor, it must be emplaced first, before any CH-TRU is brought to the room. The procedure for receiving and disposing RH-TRU waste is somewhat different from that for CH-TRU waste. Because of the large dose of radioactivity on the outside of the RH-TRU waste canister (up to 1000 rem per hour as compared to only 200 millirem per hour on the surface of a CH-TRU waste container) it must be constantly shielded. During transport the waste canister which is two feet in diameter and ten feet long (seen at right) is be placed inside the RH 72-B transportation container which is lined with two inches of lead. The 72-B shipping container only holds one canister. When the shipment arrives at WIPP, the 72-B is unloaded into a special room in the Waste Handling Building where the RH canister is be removed and lifted into the shielded Hot Cell. In the Hot Cell the waste container is inspected and then placed in a shielded facility cask for transport to the underground disposal room. 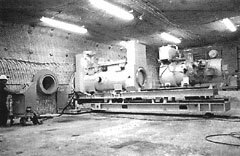 There, the facility cask is placed in the Horizontal Emplacement and Retrieval Equipment (HERE) machine (seen at left). This machine uses a hydraulic ram to push the canister out of the facility cask and into a predrilled hole in the disposal room wall. After the waste is pushed into the wall, the hole is plugged. The facility cask can be reused. Only after the RH waste is emplaced in the walls of a disposal room can the CH waste be stacked on the floor since the CH waste fills the room from wall to wall.